The beauty of obtaining a researcher’s studio apartment in Cité U lies in the fact that not only I have a roof over my head, I also do not have to deal with utility companies and waiting for internet connection. Moreover, the apartment is furnished (unlike most of Parisian rentals that tend to come unfurnished), buying me some time to select additional household items to help make me feel more at home. 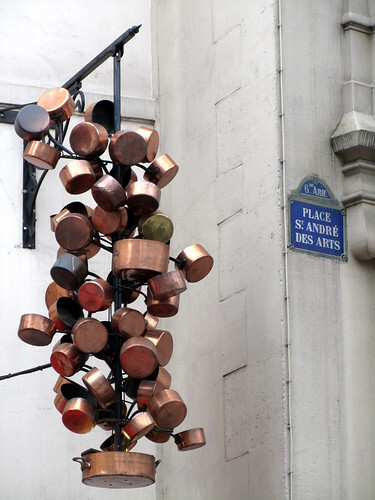 It is with envy that I looked at these lovely copper pots outside a restaurant at Place St André des Arts. I currently have a meagre one pot to use, and am shopping around for my own set pots and pans. Not copper ones though – they’re a bit out of my budget. Tefal, however, I could still splurge out for.